To do so, you need to configure your MyOmBox to remote control your SmartHouse, wherever you may be, with your smartphone, tablet or laptop. As a reminder, the DNS is a mechanism implemented in 1983 to link an IP address to a more memorable name, called domain name. 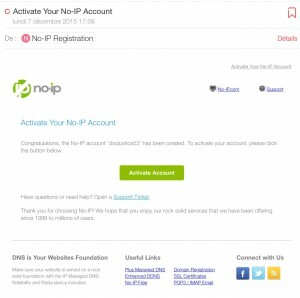 To create a free No-Ip account, click on the following link to their website http://www.noip.com/. From this home page, it seems like only two languages are available: English and Portuguese. However, if you scroll down to the bottom of the page, you can select your language. We shall therefore select French. 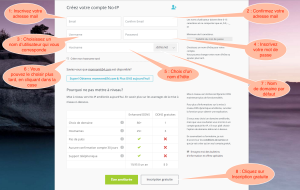 Click on the neon green box “Free sign up” and simply follow the instructions provided on the tooltip icons. 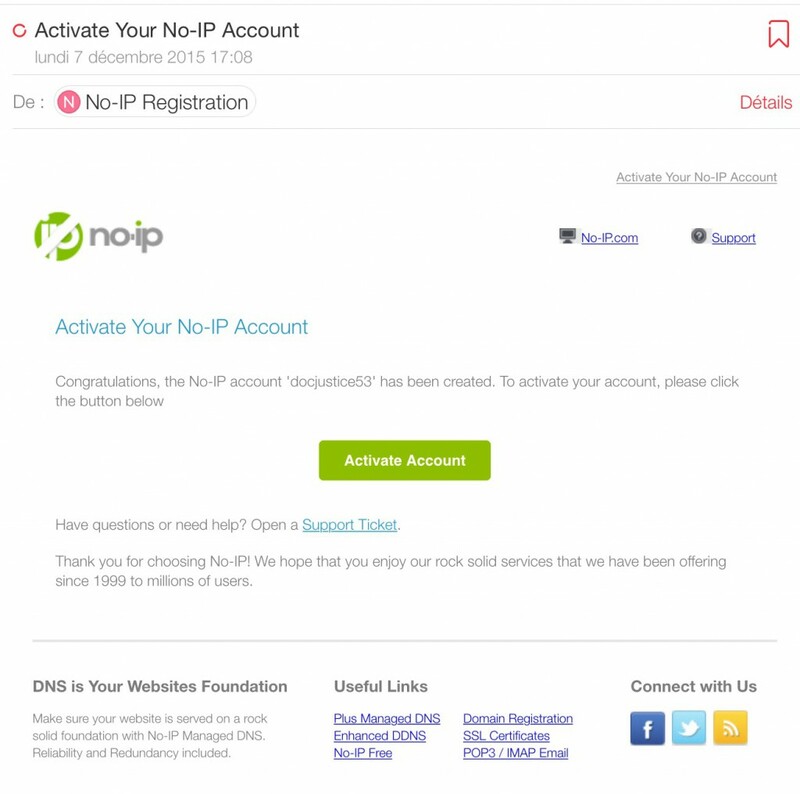 A new window opens and asks you to check your inbox (from the email you entered when signing up on No-Ip.com). Simply click on the link “Activate account” in this mail. A second window will open to inform you that your account has been activated. If, when creating your account, you haven’t typed the default domain name (which is ddns.net) log into your No-Ip account with the user name and password you have chosen. 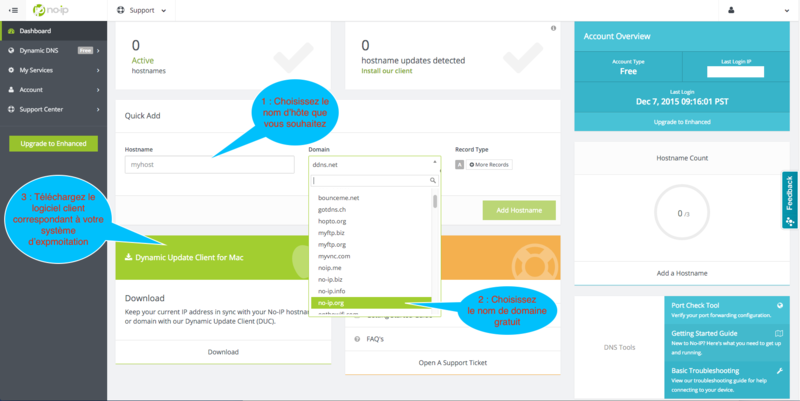 This will allow you to choose your host name (myhost) and the domain name that suit you best. You can find this list in the drop down menu. 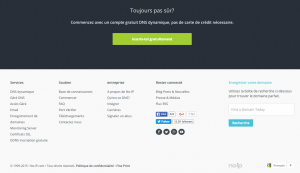 The first part (Free Domains) is free, whilst the other ones (Enhanced Domains) are paying. 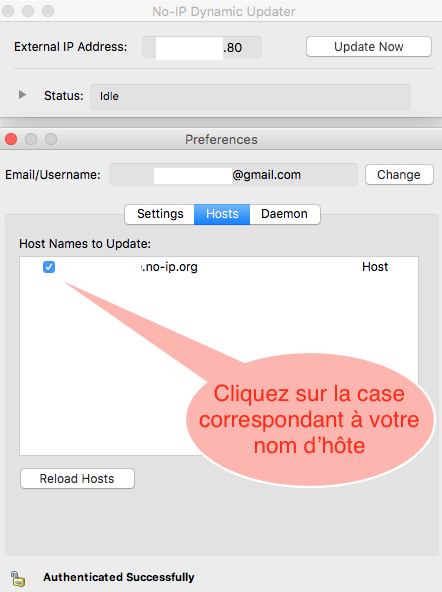 Then, click on “Add Hostname” or “Ajoutez un hôte”. Personally, I have a Neufbox. But the principle is valid for all current boxes, give or take a few details. 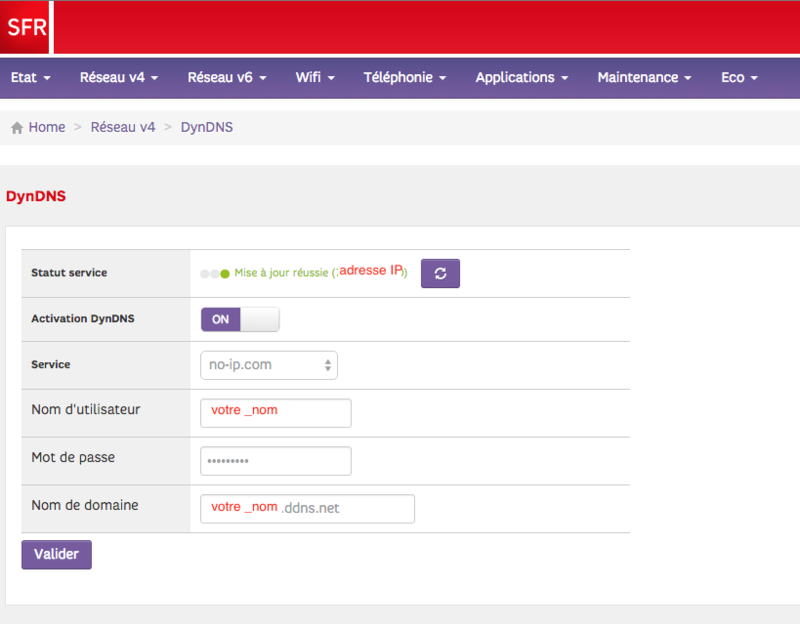 To configure this feature, go to “administration” on your ADSL box, most of the time with the IP address 192.168.1.1 or 192.168.0.1, then, in Network v4, go to “DynDNS”. An example is displayed for Livebox at the end of the article dedicated to this type of box at Orange. The IP address, displayed automatically, is the external address. It’s the address enabling you to connect to the internet. As a reminder, the internal address is the address you have from your home network. 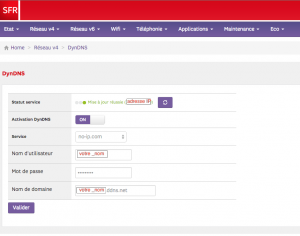 Don’t forget to turn the “Activation DynDNS” ON, and on the drop down menu, select “no-ip.com”. 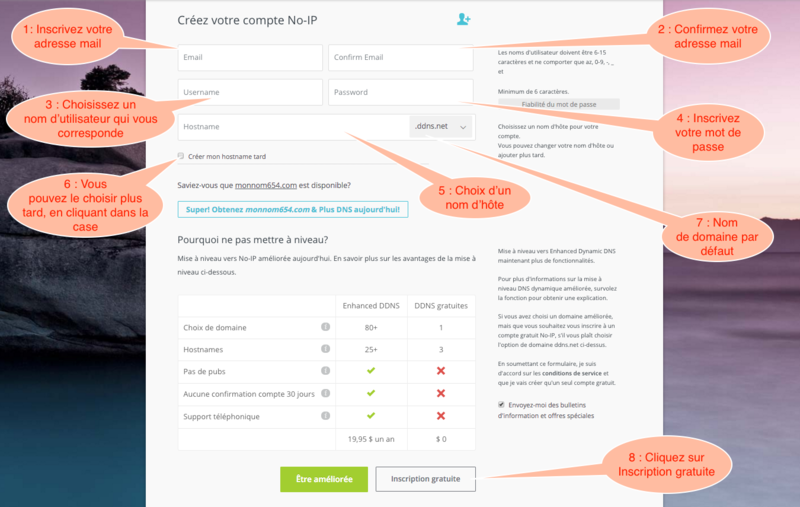 Enter the user name and the password, which you have chosen when signing up on No-Ip.com. The domain name matches the one you have created when you signed up. You are almost ready to use your MyOmBox from outside home and remote control your connected home. To complete the configuration, install a network address translation rule (NAT). 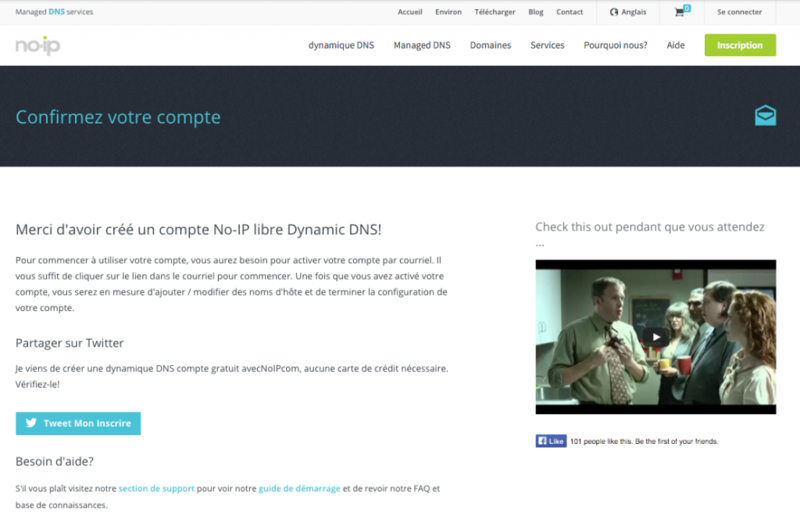 To do so, you need to go to the admin section of your ADSL box and click on NAT. Name this rule (myombox, for simplicity purposes), the protocol is TCP (this is sufficient for proper functioning of the system), the external port is 80, the IP address is the one you have already found when setting up your MyOmBox and the destination port is also 80. Then, to connect from outside home and test your 3G / 4G connection for example, you need to open the internet browser on your smartphone, tablet or laptop and enter the following URL: http://IP_DE_VOTRE_BOX_ADSL. 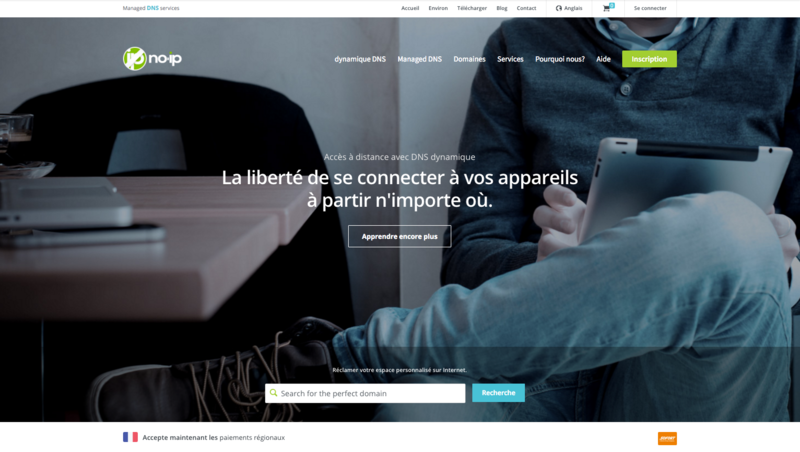 You can retrieve it by going to the website http://www.get-ip.me for example. We wish you an excellent use of your MyOmBox, wherever you may be. For those who want to go further or whose ADSL box does not have the No-Ip functionality, there is a solution to update your IP ADSL address with a software. 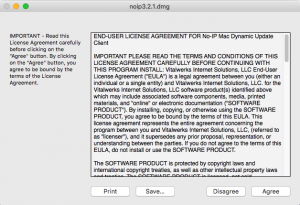 Download the dynamic client software for the operating system you use. As far as I am concerned (and for this tutorial), I am on a Mac. 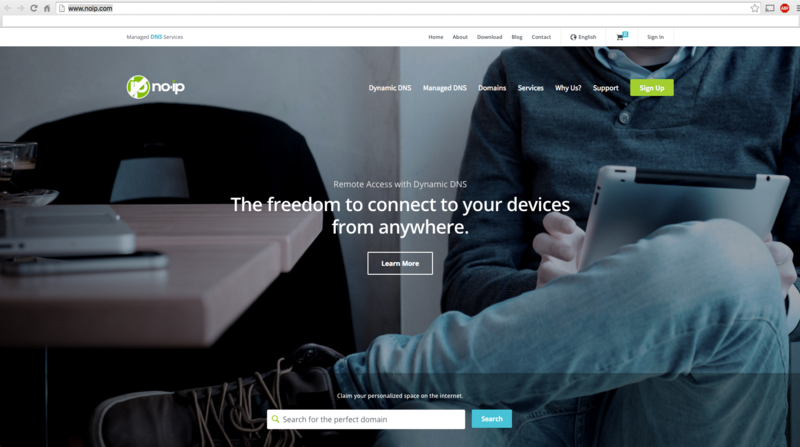 There are dynamic clients (Dynamic Update Client = DUC) for Windows, Mac and Linux. This small software constantly verifies the IP address changes on your ADSL box and dynamically updates your DNS, without you having to worry about it. 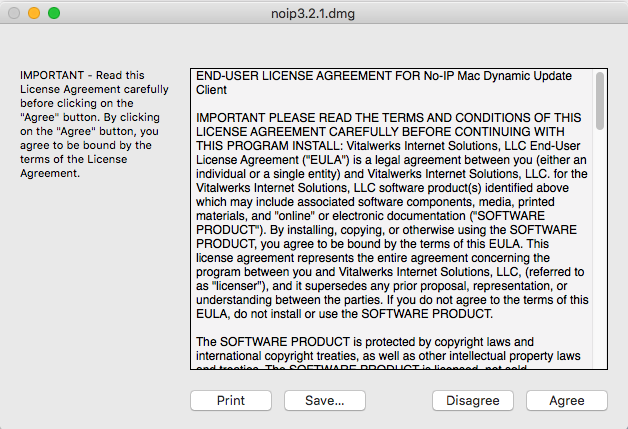 Install your DUC by double-clicking on the downloaded file, and click on “Agree” as you agree with their general terms and conditions.